SRP MPs visit border post No. 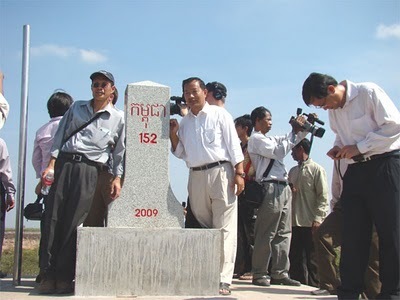 152 on 14th December, 2009. Members of parliament from the opposition Sam Rainsy Party (SRP) said they plan a make a trip to the Cambodian-Vietnamese borders to visit a number of border posts after villagers claimed they were planted inside Cambodian territory. Memot district of Kampong Cham province. been planted already, but the government will not allow them to visit border posts that are still in the process of planting.